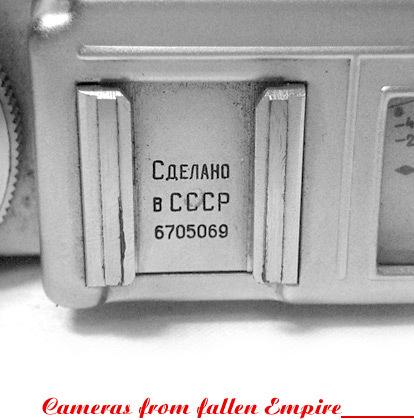 Great site..I collection Exa,Exakta system and russian cameras,too..This site is wonderful source of information..
My father bought a FED D-2, number 139384 when he was stationed in Russia during World War II. I have the camera now and am interested in its value. It has the original leather case and is in very good condition. This site is wonderful! I always use it as reference materials. Because you want to send an image of Smena which you found newly, would you show the e-mail address? The contact got an error. yet i havent seen better overview of antique cameras, but youve managed to put vast quantities of information into such clear and simple form. total respect! Thank you very much for you work! was useful to me for start my personal collection of Kiev. Best greetings from Italy. Congratulations to the homepage, it's wonderful! I own a 12XP, of course I don't use it any more, since I took on digital photography, but I still love Zenit, and I think that these cameras are indeed very fine. I read somewhere on the Web that KMZ has stopped the development of all 35 mm SLRs but two of them, and in the future they plan to build digital cameras. Let me put it this way: if the new digital cameras will be as good as the old film-based ones, we will see a renaissance of the Zenit brand! I'm planning anyway to get such a camera as soon as it will appear on the market. Very informative site. I especially like the work you have done on the Lubitels, since I have never seen such a good qualification of these cameras. Thanks a lot!